The King Mahadhumaracha(Phraaegartodsarod) of Ayutthaya era give this rank to Luangpu Tuad, the full name is "Phra Rachamuni Sameerachakunupagarn" Luangpu Tuad born in B.E. (Buddhist era) 2125 Friday April year of the dragon. His father name "Hu" and mother name "Jon", his given nick name is "Pu"
Luangpu Tuad studied at Wat Deeluang when he's 7 years old and become junior monk at an age of 15. Later on he studies with Somdej Phrachinzen at Wat Seeyung. He ordain at age of 21 years like any Thai men become senior monk. He went to study at Nakhonsridhumararth then Ayutthaya. On the way back by the ship, it's a big storm and people run out of food and water. He put his feet into the sea and the sea water become tasteless; people drink up the water and survive the storm by his powerful miracle. 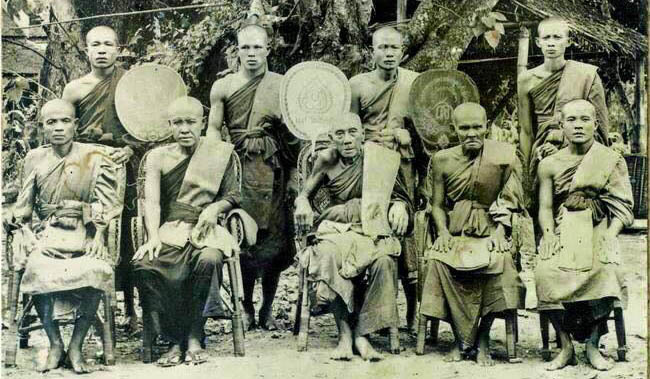 Once arrive at Ayutthaya province, he stayed at Wat Kae and study dharma at Wat Lumpleenarwas. After, he study Bali and Khom language with Somdej PhraSunkararth (leader of Thai monks) and continue to Wat Rachanuwas. That time was around B.E.2149 the reign of King Phraaegartodsarod. The time that Luangpu Tuad name are famous and well known is when the King of Srilanka "Vaddha Karminee" want to colonize Ayutthaya Thailand but without tons of dead sacrifice. He comes up with a bet of dharma question. He made a gold leafs total of 84,000 follow from Tripitaka (Buddhist canon of scriptures, the oldest and most known is Pali canon) stamp with a small letter of Pali and send to Ayutthaya. He asked that the King of Siam must translate all these Pali words within 7 days to prove the knowledge of Buddhist as Thailand is the land of Buddhism. If the king of Siam can't make it in time, he'll use all force to conquer Ayutthaya and Siam must pay a tribute every year. The King of Siam has gathered all the guru and teacher monks all over the country to do this cause. At one night he dreams, he sees a white elephant come from the west. This white elephant walk into his palace and then roar strongly the sound echo all over directions. The king asks his astrologers when he woke up, they say this is an auspicious dream that he'll see a victory. Later he knows that there is a young monk with full knowledge come from the west, he can help and translate all this Pali words. The 7 yogi master were send by "Vaddha" for the test in Palace of Siam, At the last day The young monk "Pu" or Luangpu Tuad was pray and worship his master, god and devas before he begin. Time pass until an afternoon and there were 7 words missing which is "Sung - Vi - Tar - Pu - Gar - Ya - Pa", Luangpu Tuad ask these yogi to hand over a gold-leaf and each yogi had one of them. They're all surprise and admire the practice and knowledge of Thailand Buddhism. Even such a young monk can make a full translate 84,000 words of Pali Tripitaka. A great deed Luangpu Tuad conduct to the land, the king even offers a place in palace and treasure. He denies it all and only take the name "Phra Rachamuni Sameerachakunupagarn" in the monk hood. Later on Luangpu Tuad had spent many years at Wat Rachanuwas with his peaceful practice and study. Once in Ayutthaya there was a big infection and many dead. Luangpu Tuad blessing and his holy water would bring miracle and heal people. With this great deed, the king gave him a rank "Phra Sunkararth Guruparjarn". The King says that if Luangpu Tuad wants any temple or any to re-build, I’ll be the first one to do this for him. Many years have pass. Luangpu Tuad decides to continue his pilgrimage and dharma teaching. He travels to many places, and the places he stops by become famous and holy in this day. Ex Barn Kothi Parkpanung, Hualumpooyai Aumper.Huasrai. Etc. When he arrive at Wat Pattasing which is his destination. There are thousands of visitors everyday, people given him a nick name "Somdej JaoPakoh" and even make a nick name to the temple "Wat Pakoh". This temple is almost destroyed since a war time and much need for re-construction. The king then sends 500 men from the palace to do the job. It takes around 3 years to finish. This temple at present always an important place for Buddhism, inside the Srirattanamahatarth Pagoda there are kept of Buddha relic which the arrahun monk Phramahaarnomanassri traveled to India to receive this relic. The most famous of his story is when Luangpu Tuad is around 80 years old and stay as an abbot of Wat Pakoh. His most powerful holy item is his staff and the staff was bent 3 times, it call "Mai Sarm Kod". He was meditation walking among the coast in an early morning with no people around. There was a Chinese pirate pass by and see Luangpu Tuad, the pirate has kidnap him. The miracle occurs, the winds suddenly stop blowing and the ship was floating in the middle of ocean. Many day has pass with food and water had run out, the pirate become starving. Luangpu Tuad then put his feet into the sea. With his miracle the sea water becomes tasteless and drinkable. The pirates were scared by this and then release him. On his way back to the temple, luangpu put his staff at the 2 rubber plants. These rubber plants later then grow up in an unusual look which bent all over. (At present this place is also famous. Luangpu Tuad continues his dharma teaching and practice to the end. Luangpu Tuad has stay in Wat Charnghai and Thyburi province, he order his student to burial him at Wat Charnghai when he's dead. He also orders that while his students carry his corpse, if the lymph falls into anyplace, you must root the heartwood there. In future it'll become holy spiritual place. Luangpu Tuad passed away by his old age, his student then brings his body to Wat Charnghai Aumper Koakpoh Pattanee province. Many place Luangpu Tuad spend his whole life study and practice dharma, at present people respect him as one enlighten guru monk of Thailand, his holy items are one top chart of thailand, said that any amulets or statues with Luangpu Tuad's image, they're powerful protection from evils/darkness and misfortune. With his action, thailand is one of the country which have never been colonize by intruder and the teaching of Buddha, Dharma, Sankha still maintain in the country. 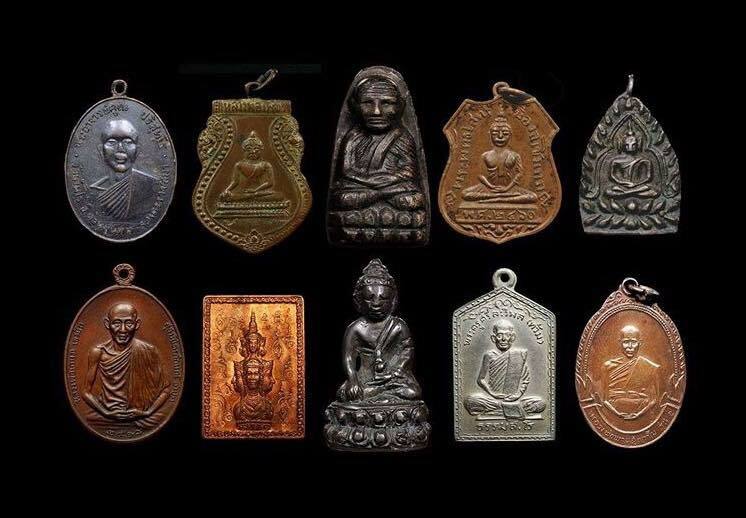 The mantra chanting ( Chant amulets/statue ) : Namotassa Pakawatoh Arrahatoh Summar Sumputassa (3times) Then think of Luangpu Tuad chant : Namo Bhodhisuddho ArCunThimayar Itthi pakawa (3times) then continue "Puttho Clawclard Dhummo Clawclard Sunkkho Clawclard" mean the Puttho Dhummo Sunkkho protect and safe fortune. Luangpu Tuad never create any amulets his whole life. By the meditation practice of Archarn Tim a later abbot of Wat Charnghai, he met Luangpu Tuad by vision meditate. 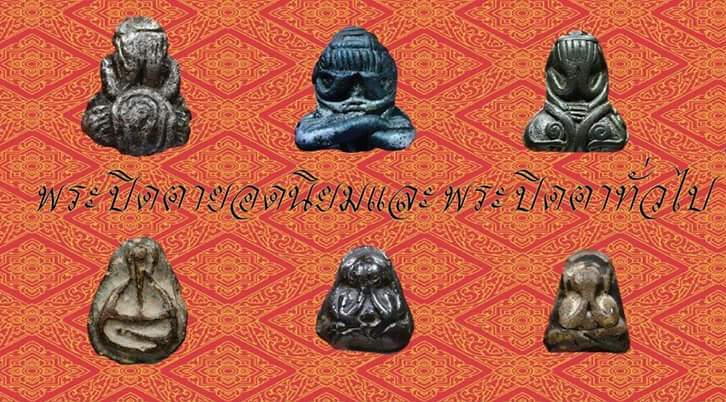 He had made the Luangpu Tuad amulets, one of the most famous Thailand amulets create in B.E.2497 old keep blessing holy item for thai people. At present there are many monks and temples create Luangpu Tuad amulets for protection, to respect and worship Luangpu Tuad as one of legendary monk. For any home or any buddhism, Luangpu Tuad amulet is the one powerful type which bring strong protection and great fortune to the wearer.